Scooper - Technology News: 5 years after Fukushima, where are the world’s nuclear powerhouses? 5 years after Fukushima, where are the world’s nuclear powerhouses? On 11 March 2011, a magnitude nine earthquake off Japan’s north-east coast triggered a massive tsunami that crashed into the Fukushima Daiichi power plant, causing the worst nuclear disaster since Chernobyl in 1986. The tsunami paralysed Fukushima and led to meltdowns in three reactors, which leaked radiation into the sea and surrounding area, contaminating water, food and air. Five years on, as Japan remembers the 19,000 people who were killed or left missing and the 160,000 who lost their homes and livelihoods, Fukushima remains an exclusion zone. In the wake of the disaster, Japan shut down its 43 nuclear reactors, and has since reopened only two. The accident at Fukushima also prompted other countries to review their nuclear energy policies. The German government vowed to phase out nuclear within 10 years and replace it with renewables. Switzerland also decided not to build any new reactors and to stop producing nuclear power by 2034 . France, which gets 75% of its electricity from nuclear power and has the second-highest number of reactors after the United States, is planning to cut this figure to 50% within 10 years. Today, 442 nuclear power reactors in 30 countries are operational. 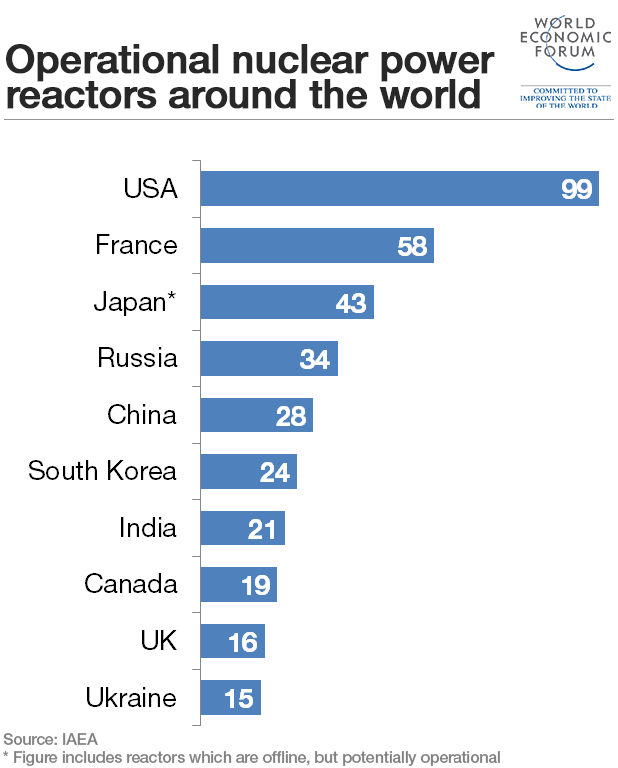 Many countries are not backing away from nuclear power. China, under pressure to cut its pollution levels and dependence on coal, aims to more than double its nuclear capacity by 2020. Meanwhile, India’s delayed nuclear power programme has just received a boost following a deal with Électricité de France (EDF) , the world’s biggest electricity company, to set up six nuclear plants. The Economist has produced an interactive map that shows the operational reactors in 30 countries, as well as those under construction and currently being planned, the amount of electricity they produce and the uranium required to run them.